Thanks to a reader who sent this in today. Sounds like it would be interesting, bringing to life a lot of the discussion we’ve had recently. And frankly, I feel the need to see JB and Karen Lewis in person. Does he keep that big smile? Does she sound as snarky live as she does in print? August 15, 2011 – Just a week after Chicago Public Schools are back in session, Chicago Teachers Union President Karen Lewis and Chicago Public Schools CEO Jean-Claude Brizard will join Chicago Tribune Editorial Page Editor Bruce Dold in a lively and topical discussion at the UIC Forum, 725 W. Roosevelt Road, Tuesday, September 13, at 6 p.m. Lewis and Brizard will take questions from the audience, followed by a complimentary reception with food and drink where audience members can continue the conversation. Karen Lewis was elected president of the 30,000-member Chicago Teachers Union on June 11, 2010. A member of Chicago Teachers Union since 1988, Lewis taught high school chemistry in the Chicago Public Schools for 22 years. During the American Federation of Teachers Convention held in Seattle, Washington in July 2010, Lewis successfully won her election as an AFT Vice President, where she has input in the national organization’s policy decisions. She also sits as a member of the AFT Pre-K-12 Program and Policy Committee. Jean-Claude Brizard was appointed Chief Executive Officer of the Chicago Public Schools by the Chicago Board of education on May 25, 2011. Most recently, Brizard served as Superintendent of Schools for the Rochester City School District. He also worked as an educator and administrator with the New York City school system for 21 years, where he served as Executive Director for Secondary Schools, Region 8 Instructional Superintendent, and as a high school principal. Brizard began his career as a high school physics teacher and junior high school science teacher. 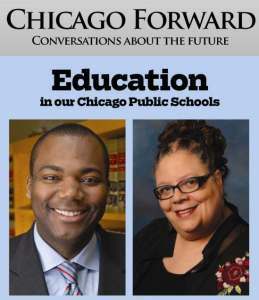 This program is sponsored by PNC Bank, and presented by the Chicago Tribune’s Chicago Forward, a series of public discussions focusing on issues important to our city, region, state and nation. Tickets for this one-night-only program are priced at $15, and include a post-event reception. Tickets can be purchased by calling (312) 222-3348 or visiting www.tribnation.com/events. Plus, Trib Nation, an initiative of the Chicago Tribune to bring news, information and entertainment to live audiences, is hosting an essay contest offering Chicagoans the chance to win four free tickets to Chicago Forward. Entrants should respond to these questions: Drawing on your personal experience, what makes a Chicago Public Schools education a success or a failure? And what question would you ask Mr. Brizard and Ms. Lewis? Entries should be sent with name and contact information to TribNation@tribune.com or to Trib Nation Education Essay Contest, 4th floor newsroom, 435 N. Michigan Ave., Chicago, IL, 60611. The contest is open to Chicago residents who are at least 14 years old. The deadline is noon on Wednesday, Aug. 31. Let’s submit a joint essay from all of us to get four free tix. “A Chicago Public Schools education can result in success or failure, depending on factors that begin with how much research a child’s parents put into studying the school system’s admissions policies for kindergarten…. In other words, the children whose parents are educated and who care will do fine, because those parents will make sure that their children do fine regardless of what is happening in the system. Sentence #3 – Even better if you have the money to partake in the plethora of independent study programs now offered to ensure that your child can get a well rounded education and perform at or above grade level. But, no matter what, if your kid has significant disabilities, forget it. Your kid is screwed. Even if your child has minor disabilities, forget it, your kid is screwed, unless the parent spends the money on a lawyer to push CPS to honor its minimum obligations under Federal law. Again, the system requires not only parent involvement, but parent spending. Why are the Nettlehorst Mothers canonized and the Whittier Mothers demonized? The Nettlehorst Mothers could write big checks. Click on “Listen to this story”. Thanks! I was hoping there was a way to listen. @7 – thanks for your post. I listened and found the discussion very interesting. I like the way he is going about the longer day. K. Lewis was quoted as not wanting to sit with the committee which she felt was a set up. That’s too bad. Brizard is speaking now on WBEZ on Schools on the Line. Call in (or email).